Get the BEST discount and savings for you and your family from Alamo Rental Cars on your next vacation. Alamo is giving some of the biggest DISCOUNTS in the car rental business. Fleur Drive & Army Post Rd. Terrace Hill is the official residence of the governor of the state of Iowa, located in Des Moines, and a second empire style architecture with 18,000 square feet of magnificent space. This beautiful home sits high on a hill that look out over the city of Des Moines with a historic 90 foot tower that allows a spectacular view of the city and surrounding area. In 2003, it became a National Historic Landmark, and was constructed by Benjamin Franklin Hill, the very first millionaire in the state, as his family home. The architect was William Boyington, a well known Chicago architect, with construction starting in 1866, and finishing in 1869. The entire cost was a quarter of a million dollars and included the mansion, all the original furnishings, the carriage house and 30 pristine acres. It was probably the most modern house built in decades, with hot and cold running water, a lift, gas lights and bathrooms. When it was finished, it sat on the west side of Des Moines, but as the city soon expanded and grew, it is now almost in the heart of the city. From the time the territory became a state in 1846, and up until 1947, there wasn't any other private residence for the governor, except for William L. Harding, from 1917 to 1921. In 1947, the state bought an old colonial style house to become the governor's residence, until 1970, when it was decided the governor needed a new house to take care of the needs of his office and host visiting dignitaries. 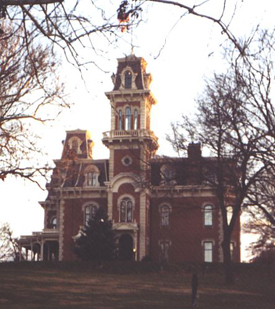 Initially, the state talked about building a new house, but the Hubbell family, the owners of Terrace Hill, offered the estate to the state as a home for the governor and his family. In the fall of 1976, Robert D. Ray became the first governor to use the house as his residence when he moved his wife Billie Ray and their three daughters into it. Every governor has since been living there, as does the current governor, Chet Culver. Most visitors stop at the carriage house first since it has become the reception area for the estate, with permanent and unique changing displays, as well as a permanent display for the Hubbell family. The first floor is the formal area, always used to receive important guests and still continues today. The vestibule is the entrance, as in previous times, a servant met guests there and they entered through two sets of doors that weigh in excess of 200 pounds each. Guests would then be taken to the reception room where either host or hostess would greet them. Right across the hall is the drawing room that was used for special occasions like weddings and funerals. Currently the room is used for important occasions like entertaining foreign dignitaries; and showcases a 7.5 foot chandelier made of crystal with hand carved laminated rosewood Belter furniture. The music room was the entertainment room in the early days, with young women playing in the room on the Steinway Music Room Grand from 1869, the year the house was finished. The dining room was used for the formal dinners by the Hubbells; and today is used for state dinners and receptions, with food prepared for the room in the kitchen located in the basement. The library was another of those rooms used quite often, by the men that gathered here for cigars and brandy; as well as housing a marvelous knowledge warehouse. This room holds many interesting items; a signed portrait of Queen Victoria, F. M. Hubbell's leather chair which is set low to the floor since he was barely over 5 feet tall. A portable gentlemen's desk and partner table is also located in here. The sitting room is also on the first floor where in the early times, people gathered here for tea or coffee and good conversation. Every one of these rooms is connected by a main hall, with ceilings 14.5 feet tall and carpeting by Wilton; with numerous portraits of special interest. On the exterior is a large porch that looks out over the city's downtown area and is used occasionally for small parties. At the very end of the great hall is the magnificent grand staircase that took you up to the second floor, with a outstanding landing halfway between the two floors. On the landing, there is a beautiful stained glass window, 9 feet by 13 feet and is often referred to as the garden in the glass; allowing light to filter through to the landing and the staircase area there. This window was added sometime between 1884 and 1890. Once you leave the landing, you have a choice of going up either right or left and getting to the second floor, the bedrooms are located here. However, today the second floor houses the governor's office; with the working office located at the capitol. The First Lady's office is also here, and not part of the tour since she is usually busy in it writing letters, speeches or planning events. The Iowa State Capitol is located in Des Moines, Iowa and houses the Iowa general assembly and was built between 1871 and 1886. Before the construction started, the grounds had a three story brick structure located here for 35 years, that housed the legislature and is the only five-domed capitol in the nation. It is made of Iowa limestone, as well as limestone from Minnesota, Missouri, Illinois and Ohio. Iowa stone is the foundation used for the majority of the porticos, with both front and back porticos having pediments supported by six Corinthian columns in each one. The dome is gilded in tissue-paper thin sheets of pure 23-karat gold and a protective layer over that to protect it from the elements; with the top of the peak, some 275 feet above the ground. When it opened in 1884, and up until 1924, it was the tallest structure in the city and maybe even the state. In 2003, they did some renovative work on the building with the four corners having domes on them as well. The capitol grounds were initially only four blocks, but in 1913, the legislature decided to enlarge it to 84 acres, that were eventually used for other state buildings. The ground floor contains a cafeteria and administrative offices, that includes the governor's office, the chamber of the Supreme Court and other executive branch offices. It also contains four annexes that hold historical battle flags from the state's history, but by 2009, only the northeast annex held a battle flag and that was a 1862 Civil War flag. The remainder have been moved and stored so that more preservation attempts could be made, and in the western wing is a 1/48th scale model of the battleship USS Iowa, as well as a memorial to the Iowans that were killed in Operations Iraqi Freedom and Operation Enduring Freedom. Budget Rent-A-Car has the best customer service staff in the car rental business that are friendly and courteous. Budget means cheap and we have locations all over the country that offer the cheapest rates on a reliable rental car. Des Moines Mun. Apt. Budget Car Rentals - 5800 Fleur Dr. The Des Moines Art Center is located in Des Moines, Iowa and houses an expansive collection of sculptures, mixed media, paintings and modern art, and opened in 1948. The center surrounds a wonderful reflecting pool and has a big exhibition hall that rotates various themed collections during the year; usually every one to three months. Outside the center is a beautiful rose garden and outdoor sculptures sit majestically around the grounds. Those artists represented in the permanent collection include; Roy Lichenstein, Edward Hopper, John Singer Sargent, Jasper Johns, Mark Rothko, Andy Warhol, George Segal, Henri Matisse, Ronnie Landfield, Claude Monet, Eva Hesse, Francis Bacon, Paul Gauguin, Georgia O'Keefe, Deborah Butterfield, Gerhard Ricter, Auguste Rodin, Claes Oldenburg and Mary Cassatt; a veritable who's who in the art field and certainly a spectacular collection of paintings and sculptures. Numerous paintings are well recognized examples of the artist or movement he or she was involved in, and these include Hopper's "Automat", that was copied onto a postage stamp and used for the cover of Time magazine. Also, "Synchromy" by Stanton MacDonald Wright, that has been copied into many texts, and Bacon's "Portrait of Pope Innocent". The original center's wing was designed architecturally in a blend of art deco and art nouveau styles by Eliel Saarinen in 1945, and then finished in 1948. I. M. Pei designed the sculptural addition in a modernist style in 1966, and finished in 1968. Rumors has risen that Pei designed the south windows, that look over the rose gardens, into PEI, but the architect has said this isn't so. The third wing was designed by Richard Meier and finished in 1985; and was created to allow as much light as possible into the wing. The center has a marvelous library, gift shop and restaurant, with seminars and workshops held on regular schedules and is free to the public. Close to Fort Des Moines, in Des Moines, Iowa, the Blank Park zoo resides on the south side, and opened in 1966. The idea for the zoo came from A. H. Blank, who donated $150,000 for the creation of a children's zoo in 1963, on the decommissioned Fort Des Moines land. The Des Moines Children's Zoo was opened in 1966, and initially designed upon nursery rhymes and contained a castle with moat, petting zoo, miniature railroad and copy of Noah's ark. During the following 16 years, the city didn't make any repairs or changes to the zoo, and was going to close in 1981, until a concerned group of residents started the Blank Park Zoo Foundation in hopes of saving the zoo. Their goal was to get funding for capital improvements, marketing and promotional methods and animal acquisitions. This foundation was successful, after creating a partnership with the city and received a $1.8 million bond referendum and $1.4 million from donations from the citizens. The zoo did close in 1982 for desperately necessary improvements and repairs. It reopened in 1986, and became an AZA accredited zoo, with a new goal of education, recreation and conservation and housed geographically themed exhibits that were very spacious and naturally landscaped for better environments for the animals. The zoo was able to buy 25.3 acres of land from the former Fort Des Moines property and 9 of the historic structures that were on it, for future growth and enlargement. They began a capital campaign to construct a new cats exhibit, as well as a 30,000 square foot indoor Discovery Center display. In 1999, the Tom and Jo Ghrist Great Cats exhibit opened and in 2001, the Myron and Jackie Blank Discovery Center opened, becoming one of the most favorite year round exhibits. The zoo houses a large variety of animals here, contained in numerous exhibits, and the Discovery Center is an area enclosed by itself, and houses many other animals and plants; and itself is separated into different sections that has made a special viewing experience for the visitors. These include; the Cave, with Madagascar hissing cockroach and Emperor scorpion; Free Range Aviary with multitudes of finches; the Butterfly garden with exotic and beautiful butterflies of every kind; the Waterlab that showcases the many uses and properties of water; the Bat Cave with Egyptian fruit bats; the Amazon pool with redtail catfish and red bellied pacu; the Coral Reef with all kinds of reef fish; Macaw housing many blue and red macaws; the Australian trail with cattle egrets, red-necked wallabies, giant kingfishers and emus; the Contact Area with koi, trumpeter swan, goat and llama; Great Cats with snow leopards, lions, servals and Siberian tigers; Marine animals that include harbor seals, Magellan penguin and California sea lion; the African section with zebras, reticulated giraffes and bongos; American bald eagles and the Kids' Kingdom that has an exciting playground area and many petting animals like zebu, sheep, koi fish, llamas, goats and miniature monkeys. In 1997, the z oo conservation committee began raising money for a number of worldwide conservation projects, and in 2005, the committee chose to participate in four unique programs; the Panamanian golden frogs program involved releasing the captive frogs into the wilds again; the International Snow Leopard Trust that was created to protect the natural habitats of the snow leopard; the Great Ape Trust that rescues orangutans and bonobos in areas that have been deforested and poaching is growing; and the Hornbill Nest Protection that stops the illegal poaching of hornbills. 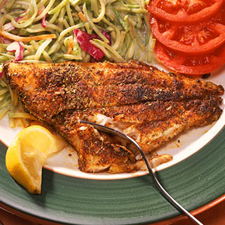 Starters; house salad is mixed greens with apples; red onion, peanuts tossed in honey mustard; Muscle Beach mussels with garlic bread; quesadilla with filling changing daily; bag-o-bones; bass-ackwards' chicken wings; smoked chicken dip with red chili tortilla chips; pulled pork tacos with navel orange & red onion salsa. Smoked Goods; choice of two sides; Memphis-style rib dinner full slab; Memphis-style rib dinner half slab; big chop sliced right off rack; Pick 3 BBQ platter choose from ribs, chicken, andouille and brisket; chicken dinner half chicken. Entrees; Latin Strip steak with chimichuri sauce; Latin pesto with black beans & rice; Cajun shrimp & dirty rice; Coyote strip with potato & grilled corn; smoked pork tenderloin with sauce, black beans & rice; Joe's special is split Cajun chop over red beans & rice; seared yellowfin tuna with mango salsa over black beans & rice; grilled mahi mahi honey-basted & pistachio-encrusted with fresh fruit salsa & sautéed veggies; Cajun catfish with choice of Chicken Creole or red beans & rice; seared Latin bassa with chimichuri sauce, served with black beans & rice; lime & garlic shrimp with mango salsa over black pepper fettuccine; shrimp Creole; mango shrimp rundown; red surf-n-turf, Cajun catfish & ribs with red beans & rice; Louisiana platter is red beans & rice, chicken Creole & andouille sausage link; tuna served over large house salad with corn bread; seared tuna salad; sliced brisket over large house salad; red beans & rice is a meaty version; chicken Creole; lime & garlic chicken with mango salsa over black pepper fettuccine; chicken from the other side is grilled breasts stuffed with goat cheese & asparagus with potato; citrus-marinated grilled chicken salad with candied pecans tossed in cilantro-lime vinaigrette with corn bread. Starters; southwest spring rolls is smoked pork, cheddar jack, black beans, corn, onion with sweet chili sauce; boursin cap mushrooms is herb boursin cheese & crab stuffed mushrooms baked in Topping Pale Ale; spinach & artichoke dip with baked parmesan pita points; CABco wings with Cajun wing sauce, blue cheese & veggies; spent grain pretzels with beer cheese, caramel & stone ground mustard; pot stickers with seasoned pork, garlic, ginger with sweet chili & Thai basil sauces; bruschetta with ricotta, romas, shallots, basil pesto & parmesan; shrimp & andouille is Cajun sautéed shrimp & andouille sausage with garlic foccacia & lemon. Steaks & Chops; 309 prime rib is aged & slow roasted prime rib, horseradish cream & au jus with white cheddar mash & house veggies; CABco filet & cakes is 21 day aged premium beef tenderloin with garlic aioli crab cakes & prosciutto wrapped asparagus; petite deburgo is petite tender medallions with creamy deburgo, white cheddar mash & house veggies; BlackHawk BBQ chop is double cut, bone-in Duroc chop smothered in Blackhawk Stout BBQ with mac & cheese & house veggies; Asian flat iron is flat iron steak over soba noodles with broccoli, carrots & mushrooms in garlic soy broth; currant pork medallions is bacon wrapped pork tenderloin medallions, black currant wine sauce, with white cheddar mash & house veggies; orange rosemary tenderloin is pork tenderloin with orange rosemary glaze, caramelized onion polenta cake & house veggies; Jack Daniel's sirloin is 10oz. Jack Daniel's marinated sirloin with white cheddar mash & house veggies. Fresh Fish & Seafood; seared scallop pasta is seared scallops, spinach, fried prosciutto, seasoned bread crumbs & angel hair pasta with Galliano cream sauce; sesame tuna salad is seared sesame tuna over romaine, Asian veggies, sprouts & wontons, with sesame soy vinaigrette; blackened salmon gnocchi is blackened salmon over lemon dill gnocchi with house veggies; lemon scallop salad is seared scallops over mixed greens with grilled asparagus, romas, feta & lemon vinaigrette. Hertz Rental Cars and RentalCarMomma.com have joined together to give their customers the BEST deals in the nation. Let Hertz put you in the driver's seat today with their new Printable Coupons. Hertz Rental Cars Des Moines Intl. Apt.- 5800 Fleur Dr.
Elliot Aviation Hertz Car Rental - 2800 McKinley Ave.
Hertz Rental Car Signature Flight Support- 5400 Fleur Dr. The Salisbury House is located in Des Moines, Iowa, and is often referred to as the Carl and Edith C. Weeks House and Gardens; and is a blending of Tudor, gothic and Carolean styles of architecture. The manor home was modeled after the King's House in Salisbury, England and was finished in 1928 at a huge cost of $3 million for the cosmetics king. It contains 42 rooms and is 22,000 square feet, added to the List of Registered Historic Places in Iowa and put on the National Register of Historic Places in 1977. The magnificent manor sits on 9.4 acres of landscaping with two other structures as well as another site and building included in the registry. In 1934, the Weeks' donated the estate to Drake University, and in 1954, the Iowa State Education Association bought the property from Drake to use it for their offices. In 1993, the foundation was created and bought it all to restore and preserve it for future generations. In 2004, a $7.5 million campaign was started to finish the Master Restoration Plan. The Weeks built the Salisbury House with the idea of turning it into a museum eventually and collected many historical relics from around the world and put them in the house. Currently, there are more than 10,000 historic relics in the manor, that includes a magnificent library of rare first editions, that contains a few first edition Ernest Hemingway books with notes from the great writer inside. The house also houses many beautiful paintings, historic architecture, 16th century tapestries and a collection of historic documents signed by such famous personages as Abraham Lincoln, John Hancock and Jefferson Davis. The State Historical Museum was created to display the stories of the people of Iowa and the growth of the state through exciting exhibits of historical relics and documents. It is located in Des Moines, Iowa. Their permanent exhibits include Rarely Seen: Cool Stuff from the Museum that is located on the second floor and contains unique artifacts like Abraham Lincoln's glasses, a Daniel Boone rifle, George Washington's hair, military uniforms, weapons and ammunition, plus many other marvelous relics. The Caucus Iowa exhibit is on the first floor and showcases the caucuses, how they work and why, effects on the candidates and the difference between these caucuses and other variations of the presidential process. A replicated coffee shop is shown, where Iowans experience their idea of "retail politics"; with a living room and gym to show how the caucuses actually work. Also on the first floor is Captive Nature: The Wildlife Dioramas of Joseph Steppan that house many wonderful dioramas depicting the diversity, history and conservation efforts of the people here. In the atrium, the Patten's Neighborhood: Memories of the Center Street Community shows the African American history in the state and their outstanding contributions; with a great exhibit about Robert E. Patten, who ran a Des Moines print shop from the 1920s to the 1960s. Another display on the first floor is the Delicate Balance: Human Values and Iowa's Natural Resources, detailing the way that the inhabitants of the state have used their natural resources since prehistoric times to the present day. It highlights wildlife, Native American collections and fossils; allowing you the opportunity to stand in a coal mine with little room to move, listening to miners as they work, drill a shot hole into coal and Walk in Beauty, the study of beadwork and moccasins. In Wings Over Iowa there are three vintage aircraft that offer the contributions and flying experiences of Iowans involved in aviation. You Gotta Know the Territory looks at the early days of the state, when it was just a territory, from 1838 to 1846, and highlights immigration, town life, cultures, human rights and farming. You can push a plow here or try using a two man saw and a special video that narrates the diary of a young girl traveling in a covered wagon on her family's way west to Iowa. On your next visit to Des Moines, Avis Rental Cars will make your visit the best. Avis will help you choose the best vehicle for your trip and our friendly staff will help. Avis is offering their customers the BEST deals in the country with the new Printable Coupons. Avis Car Rental Des Moines Mun. Apt.. - 1200 Airport Dr.
Avis Rental Cars W. Des Moines - 2851 104th St. The Mary and John Pappajohn Sculpture Park has been constructed at a main crossroads in the city of Des Moines, Iowa and it is considered one of the most unusual sculpture gardens in the nation as it continues to contribute to the ongoing revitalization of the area. It highlights 24 works that were donated to the Des Moines Art Center by the Pappajohns; as well as eight new gifts from their unique collection and a newly commission work by famed artist Deborah Butterfield. The Pappajohn's original contribution entailed some 16 works of art for the park, the most important donation of artworks ever made to the museum at one time, contained sculpture by such notable sculptors as Anthony Caro, Louise Bourgeois, Willem de Kooning, Richard Serra, Ellsworth Kelly and Martin Puryear. These sculptures were valued at more than $25 million and was complemented by another gift of eight works by Deborah Butterfield, Sol LeWitt, Ugo Rondinone, Tony Smith and Gary Hume. The sculpture park has positively changed the landscape of the downtown area in such a dramatic way that hadn't been seen in this city since its opening of the Des Moines Art Center in 1948. The impact of this magnificent gift can never be overemphasized, giving the city a new outlook for the museum and the city. In the early 1990s, NY based project architects Mario Gandelsonas and Diana Agrest developed the master plan for the city and made the designs for a new park that showcased rolling hills and crescent-shaped open cutaways that are framing the works. Backdrop walls have been created out of mounds going through the park and has a narrative of suspense since the sculptures will never all be visible at one time. As visitors meander around the park, they will be surprised and delighted when they come over a crest and see one of these magnificent sculptures rising out of the ground to often mesmerize them. Today, those works are valued at more than $40 million and contains works by artists not mentioned above; Scott Burton, Tony Cragg, Barry Flanagan, Mark di Suvero, Jaume Plensa, Joel Shapiro and William Tucker. The story of the Pappajohns is another exciting story of overcoming adversity and the language barrier to fulfill the original American dream. John came here as a child from Greece and worked his way through the University of Iowa, gaining amazing business successes, starting his own business and then investing in others. Currently, he is one of the state's most successful entrepreneurs and venture capitalists; with his wife, Mary, becoming partners in philanthropic opportunities that have given the region almost $50 million in community developments, scholarships and educational initiatives. The Science Center of Iowa was created to develop lifelong learning experiences that highlight six dynamic platforms and visitors can enjoy the experiments and explorations. Located in Des Moines, Iowa, the center enables the visitor to develop their power of learning by empowering them to learn how to learn, and not so much as what to learn. Besides the experience platforms, there is a 216 seat Blank IMAX dome theater, 50 foot domed theater and 175 seat John Deere Adventure theater that has live performances. 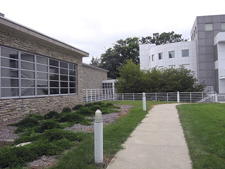 The Iowa Learning Center contains the educational programs for the SCI and highlights resources for both students and educators, outreach and distance learning and well known preschool. The SCI programs go out to every county in the state, giving unique experiences to the residents and promoting cultural awareness. The divers range of opportunities afforded by SCI is of great importance and enjoyment to the community and has been found to be both fun and educational; becoming the foundation for the successful growth and continuation for over 30 years. One of the most important contributions that the center has given to the residents of the state, with the hands-on displays, special format theaters and other unusual facilities is the improvement of quality of life for them and for those visitors that come here to learn more about this marvelous facility. It is also an important venue for gathering to discuss the bigger interests of the community. The 110,000 square foot center has become a dedicated center for lifelong learning and fun for all those that enter. Their live programs and hands-on activities entice you to play, touch, discover and experiment. You can explore a cave, create your personal planetarium show in excellent experience platforms or blow a bubble. Thrifty Car Rental has been a staple in the rental car industry for many years now. Thrifty customers will get the BEST selection of quality cars to choose from and the friendliest customer service to help. Thrifty Rental Car will give you the cheapest deal and it is one of the best known companies in the rental car business with the most locations nationwide. Des Moines Apt. Thrifty Rental Cars - 5800 Fleur Dr. The Reiman Gardens at the Iowa State University in Ames, Iowa is one of the biggest public gardens in the state and the magnificent gardens offer a beautiful entrance into the Iowa State University and the city, set on a wonderful 14 acre site; with splendid distinct gardens inside and outside. There is a wonderful indoor conservatory and 2500 square foot butterfly wing indoors, gift shop, five greenhouses and butterfly emergence cases to invite you to view these incredible creatures as they leave their cocoons and emerge as spectacular butterflies. The gardens contain many award-winning features and just finished planting a marvelous rose garden in a public garden that mixes the designs, gardening practices and plants; a first in the nation. The gardens goal is to encourage gardeners to use less chemicals, but hardier plants that are native to an area, less labor and water, and to make the garden more practical and beautiful. It is owned and operated by the Iowa State University and offers year round learning through their educational programs and special events. The gardens are visited by around 100,000 people each year with 14 full time staff members, many part-time people, 40 students and 10,000 volunteer hours. The university has contained a horticulture garden since 1914, and this is their third location. After existing in two previous locations, and always seeming to need expansion room, faculty in the horticulture department and school administrators talked about moving the gardens to the entrance to the city and university. In 1993, alumnus, Roy Reiman and his wife, Bobbi, donated $1.3 million to start the first phase. Construction began in 1994, and officially dedicated in 1995, spread out on only five acres, there was the herb garden, entrance court, campanille garden, rose garden, maintenance building and Mahlstede Horticulture Learning Center. In the past eight years, the gardens have grown to 14 acres with the Conservatory Complex and Christina Reiman Butterfly wing that opened in 2002. The Des Moines Botanical Center is located in Des Moines, Iowa and sits on 14 acres of the east bank of the Des Moines River; starting out in 1929. It began with a city greenhouse on the west side of the river in 1939, and was a production and display greenhouse until the present botanical center was finished in 1979, managed and operated by the water works department. The center contains tropical and sub-tropical plants, orchids from high rainfall and arid regions, cacti and succulents that grow in a 150 foot geodesic dome. Also found in the center are free-flying birds, big koi, turtles and white catfish. Their outdoor gardens include many water gardens and cascade; as well as miniature roses, dwarf conifers, herbs and other native plants all sitting in beds. There is a gift shop, riverwalk cafe, rentals, tours and other fascinating opportunities to enjoy and indulge in the beautiful gardens, as well as many outdoor activities and adventures to delight you and your family. The dome tours are usually 45 minutes to an hour long, depending on how much time you plan on spending here, or at the various gardens. Photography is permitted both inside and outside. When you want the best discount and the most reliable vehicle, use Dollar Rent-A-Car. You know that you will get the best deal on a new quality vehicle when you use a company that has a name like Dollar. Dollar Discounts and Savings makes your vacation worry free and easy. Des Moines Apt. Dollar Car Rental - 5800 Fleur Dr.
Hoyt Sherman was born in 1827, and the youngest of 11 children that included older brothers John, creator of the Sherman Anti-Trust Act and William Tecumseh Sherman, a general and Civil War hero. Hoyt came to the Des Moines are in 1848, and sometime later was made the postmaster. He constructed the first post office and bank, served on the town council and became quite involved in state and local politics. He was appointed the Army paymaster at the outbreak of the Civil War by President Lincoln, who made him a major. When he returned to Des Moines, he started the Equitable of Iowa Insurance Company and while this went on, he donated his time, money and council to the city for the creation of schools, waterworks system and numerous other facilities. He passed on in January of 1904. The Hoyt Sherman Place was constructed in 1877 and was empty after his passing until 1907, when the Des Moines Women's Club started using it as their clubhouse, adding a gallery to showcase their artworks, making this the first public art museum in the city. The women's club was always active, bringing many speakers to the place to educate and entertain; including Helen Keller, Amelia Earhart and Grant Wood. Soon, they needed to expand for their speaking engagements and other special functions, so the 1400 seat theater was added in 1923. Presently, it has been more than a century since Hoyt built his home, and his place is still a community attraction and destination. The Hoyt Sherman Place Foundation has kept this historical landmark alive with many splendid art exhibitions, concerts, wedding, tours and business functions. The Hoyt Sherman Place sits on the eastern edge of the historic Sherman Hill district in Des Moines, Iowa, and contains one of the most significant entertainment, meeting and banquet facilities in the city. The beautiful home has parquet floors, carved mahogany entrance and marble fireplaces that has been enlarged over the decades to include an elaborate and outstanding art gallery; plus a wonderful and historic theater. The acoustically perfect theater is referred to as the "listening room" hosting a number of musical genres from new rising stars to legendary artists and singer/songwriters. The Boone and Scenic Valley Railroad is the heritage railroad in Boone County, Iowa and was created in 1983 by a group of volunteers that wanted to save the scenic section of the former Fort Dodge, Des Moines and Southern Railroad. The Chicago and North Western (CNW) bought the entire FDDMS railroad in 1968, and the area of track mentioned flows through the Des Moines River Valley and has a marvelous high bridge. It goes 12 miles from Boone through the small town of Fraser and stops at the former town of Wolf. The BSVY was soon a success and has been expanding ever since it started, with a permanent station that is also a museum and ticket office building with a lot of parking for the summer tourist season. In 2002, the UP railroad donated another 1.7 miles of track and the only remaining right of way from the FDDMS and soon the Boone and Scenic Valley Railroad was hauling freight. Today, the railroad owns a few locomotives and dozens of cars, and gained national attention in the 1980s when it acquired the last new 2-8-2 Mikado steam engine constructed in China. Naturally the locomotive has had numerous maintenance problems, but it is still in operations. In 2002, the BSVY purchased and restored an EMD FP9, which was originally a VIA Rail Canada passenger locomotive and was painted in the Chicago and North Western Railway colors and runs the BSVR dinner train. The rail also has a short trolley ride and done some light freight switching at Boone Industries lately and the station is only a block from the Union Pacific Railroad mainline. The track was originally constructed in the 1890s and as the power plant completed in Fraser in 1907, the line became electrified with cars going from Fort Dodge to Des Moines and side lines to other towns. The steel bridge was built in 1912-1913 and the last trolley service ran in 1955. The depot was dedicated in 1985, after having been reconstructed using bricks from other platforms and the interior oak woodworks came from the depot at Tama. The steam engine cost $350,000 and the first dinner train ran in 1999. National Car Rentals will get you on the road quickly and without any hassles. National's friendly staff and quality cars selection will make sure your vacation is more enjoyable with the new National Printable Coupons deals. Fleur Dr. & Army Post Rd.